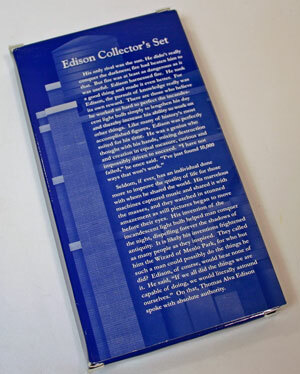 In honor of that quote and the current trials and tribulations of the incandescent light bulb, both here and abroad, let’s take a look at a special Edison Collector’s Set. 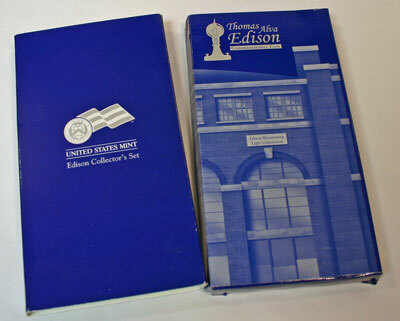 Another box inside the first included a blue-toned image of the Edison Illuminating Light Corporation’s building with Thomas Alva Edison Commemorative Coin written at the top beside an early form of the light bulb. 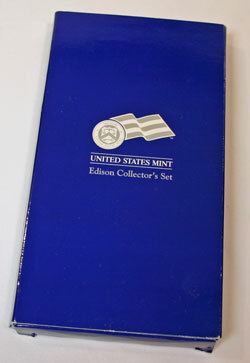 Inside the box, the left portion includes a picture of Mr. Edison, from which the coin’s obverse design was adapted, with the Certificate of Authenticity and coin specifications below. 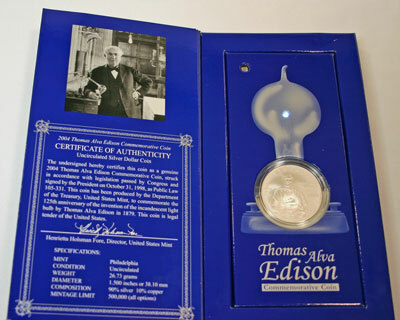 Opposite, an image of an old-style light bulb contains a small bulb at the juncture of its filaments while the uncirculated Thomas Alva Edison commemorative silver dollar forms the base of the light bulb. Most likely, Mr. Edison would be intrigued by the batteries and circuitry provided to light the small bulb in this special set. 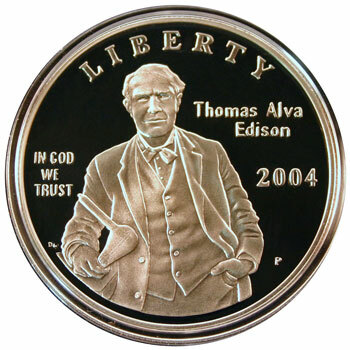 The Thomas Alva Edison Commemorative Silver Dollar in the Edison Collector’s Set is an uncirculated coin, but let’s view the details, obverse and reverse, of a proof version of the coin. 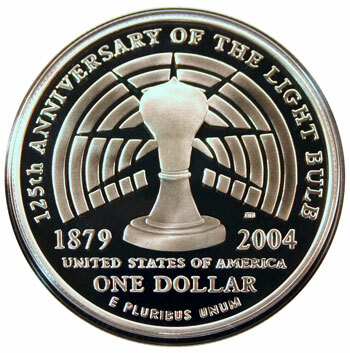 As you see, the obverse design is not quite the same as the picture, but it’s similar with Mr. Edison in his suit and holding one of his light bulbs in his right hand. Instead of his left hand held at his waist outside his coat, the coin’s image has his hand casually and comfortably in his left pocket. This bulb with its rays of light compares closely to the artistic image of the bulb inside the box. 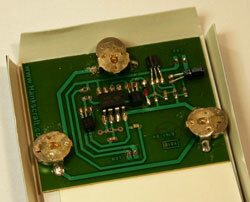 More information can be found about Thomas Alva Edison at the Smithsonian. A picture of one of Mr. Edison’s early light bulbs can be seen here. Plus, more information about Edison’s life and inventions, the light bulb and many more, are found here. In closing, he overestimated our knowledge. Just look at the rapid changes in technology and what we are still learning from the depths of the oceans and the vastness of space. We could restate his comment as, “we don’t know one billionth of one percent about anything,” or maybe even one-trillionth. But, the best lesson he provided is to keep learning and to keep trying even after you find the ways that don’t work.